In the morning I hit the road early and drove to Prague. On the D1 route through the Czech-Moravian highlands I was surprised by two pretty heavy snowstorms, but I arrived (unexpectedly) on time, because there were hardly any traffic jams into the city. Had a few meetings in our Prague office, then drove to Andel for a lunch with a few rowers interested in rowsandall.com. It was a very positive meeting, and perhaps some nice side projects result from it. It’s encouraging to see that people see the value of the little toolset I have built in the past year. Well, yes I was interested. Currently I am working on Data Fusion. I need this because on my rows at the rowing club, I am working with Concept2 ergs with the older PM3 monitor. 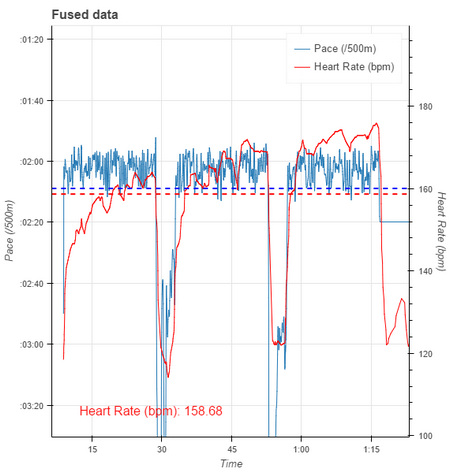 I have no heart rate dongle for that, so the idea is to capture the PM data with one app and record heart rate with another app. 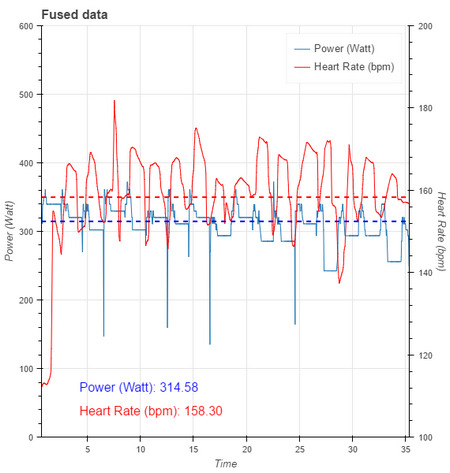 Then fuse the data, which means that I add the heart rate data to the PM data into a new workout. It sounds very simple, but there is some time alignment and interpolation involved. Fortunately, it is easy to get Python and its Pandas package to do this to your data. I did a sprinterval workout yesterday, after an uneventful drive back to Brno. I went to the rowing club and dialed up 45 seconds “on” vs 1:15 “off”. Unfortunately, Painsled didn’t do a very good job at recording the workout. It didn’t record the real power and pace in the “off” sections. Also, I need to replace the battery in my Wahoo heart rate belt. It is showing some weird value swings. Hope it is just the battery.